February 4, 2015  In the band's latest video, for the song "Competition," singer and guitarist Meric Long reveals his passion for modern dance. September 25, 2009  The message of "Small Deaths" moves beyond the mostly internal narratives of The Dodos' early material, and instead opts for eco-conscious metaphors to go with more personal reflection. Far more than just a vehicle for The Dodos' inventive instrumentation, "Small Deaths" makes a full connection with brains and feet alike. 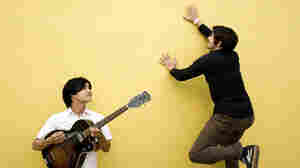 April 4, 2008  The Dodos are a San Francisco duo who build a clattering sound out of minimal elements — just acoustic guitar, drums and voice. The band visited the BPP studios to play songs from their new disc, Visiter. March 28, 2008  The Dodos were touring heavily during the creation of their latest album, Visiter, so it seemed natural for the band to try to replicate their live sets once they got to the recording studio. The propulsive energy they were able to capture helps push Visiter into bold new territory for The Dodos. Their sound has matured, the songs are more developed and it's a vividly textured album that mixes prog-psyche folk with poly-rhythms and ephemeral themes. 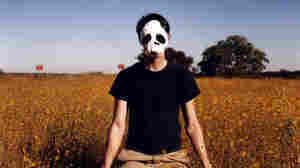 "Walking" and "Red and Purple"
November 21, 2007  Meric Long and Logan Kroeber write experimental folk as The Dodos. Their music is intricate and often intense, with quick guitar picking, drum clicks, and tribal beats. The duo's new CD is Beware the Maniacs. March 7, 2011  There aren't many bands more reliant on drumming than The Dodos: The new No Color pounds and clatters with such precision and clarity, the whomp of the drums might as well get a lead-vocal credit. Hear the album here until its release on March 15. March 1, 2011  On this week's show, Radiohead's surprise album gets a little time to sink in. 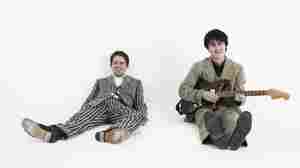 Plus: new music from Panda Bear and The Dodos, and the final chapter of Son Lux's album-in-a-month challenge. June 11, 2010  The Dodos' latest album, Time to Die, centers on Meric Long's syncopated guitar rhythms, aided by the drums of Logan Kroeber and Keaton Snyder's vibraphone. Hear The Dodos perform live from the Bonnaroo Music Festival in Manchester, Tenn.
March 10, 2009  Like a less frenetic Animal Collective, The Dodos' members combine country-blues finger picking and tribal drumming in a way that's propelled them to the forefront of experimental folk music. Last year's Visiter aims to capture the bouts of passionate singing and explosive drum rhythms that characterize the band's live sets. April 7, 2008  The Dodos' music combines the propulsive drive of Sonic Youth with the odd pop quirks of Animal Collective — surprising, given that the band only has two members. Meric Long and Logan Kroeber combine brisk guitar work and pounding drums to chaotic and ethereal effect.